The facility is available to school district students, as well as community members. In addition, it is utilized by other area schools and for special events. These include: Rice Lake graduation, Drum and Bugle Corp. competition, and to host regional or sectional athletic events.This complex is a true asset to our community. 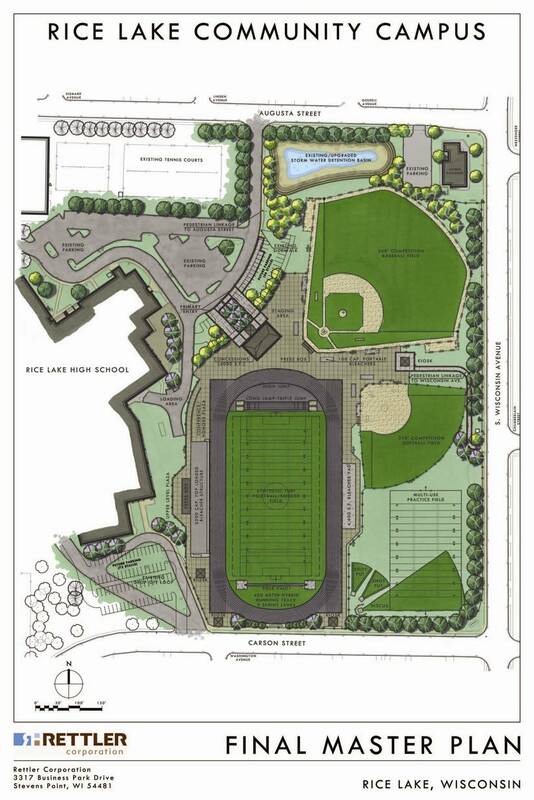 The $3.7 million project was funded by $1.25 million from the Rice Lake Area School District, $562,000 from the City of Rice Lake, and money from local businesses and private donations, including a $500,000contribution from Foster & Lynn Friess. We invite you to visit the links in the menu to the right to learn more about the facility and to join us in supporting it. This message brought to you by The Rice Lake Community Campus Coordinating Committee and The Rice Lake All-Sports Booster Club.